Rips Bar is a historic part of Phoenix Arizona's past and future. One of the few "old school" establishments that is still standing even during this time of renewal in Phoenix. 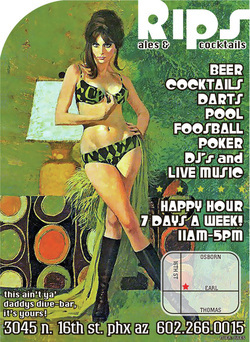 Laced with a rich past, Rips is a family owned and operated "dive bar" with a cool twist of retro meets current trends. Focusing on live local rock bands and hot DJ's. Rips allows you to be you without being dressed to the 9's or leave you wondering "am i cool enough." This is a come as you are type joint where you can meet characters from a Bukowski book as well as the local hipsters plus the walls are constantly covered in eye popping original artwork from local creatives such as Jules Demetrius, JB Fail, Carol Roque, Mr.43, Sentrock, Xappa, THNK9000 and many others on any given night. Ever expanding its range, Rips, is also branching out to national acts like THE GREEN LADY KILLERS. Rarely, is there a cover charge but always present is a good time. You're going to be walk in and stumble out due to the amazing happy hour and you will need a cold beer or cocktail after seeing our HOT bartenders. Rips is soon to become the place to go, the place to be seen, and be heard. This ain't ya' daddy's dive bar... IT'S YOURS!